Is there anything more British than a Chesterfield? It’s an item we have always admired from afar. Effortlessly chic and completely timeless. The scent of the leather, the firmness of the cushions and the recognisable dimples and studs is completely unmistakable. We have been wanting to update our old leather sofa for years but were undecided on the style to go for. We couldn’t believe it when Distinctively Chesterfield contacted us to see if we were interested in collaboration. We had decided months previous that our next sofa would need to be a sofa bed. Our daughter has now moved into the biggest of our spare rooms and in the event of a second child, we would be left with no spare rooms for guests. A sofa bed would open up this space for friends or family to stay in the living room without disruption of the upstairs bedrooms. 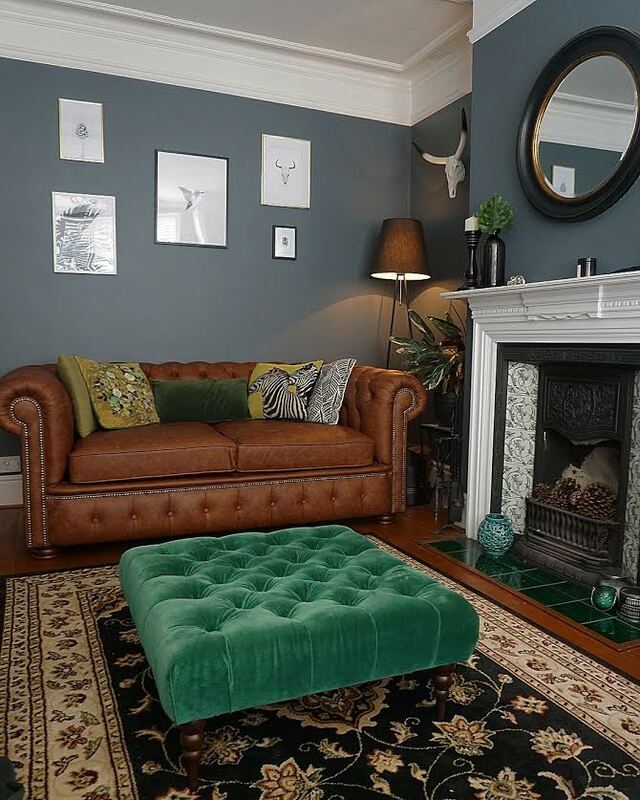 After perusing their site we realised they also did Chesterfield Sofa Beds! Who knew!! We consulted with the team at Distinctively Chesterfield to discuss the size, style, fabric and finish that we liked. We narrowed it down to three leather shades and after receiving samples we settled on Vintage Whiskey. We wanted a warm tan without too much yellow or too much red. Now that we have painted our room much darker we were cautious to go too dark with the leather shade. The vintage tan shade would also work well if we redecorated or even moved house. Chesterfields are like a family heirloom, you will definitely have it for the rest of your life and pass it along to family, so it’s good to go with a classic tone I think. We selected the 2-seater London Chesterfield sofa bed in Vintage Whiskey. We went for the foam and fibre filling, as we believed it would last longer. We also chose the pleated border with brass studs and oak feet. We were gifted our Sofa in collaboration with Distinctively sofa however the cost normally for our sofa would be £1800. The cost will vary depending on the extras and finish you want. As a sofa you would never know it’s a sofa bed. There is no creaking or uncomfortable feeling. It’s exactly like a regular Chesterfield in the ‘comfortability’ stakes. When you decide to pull out the sofa to switch to the bed you simply remove the base cushions and flap over the felt cover. There is then a long metal bar, which you simply pull towards yourself and the rest just cantilevers out. The mechanism is smooth and easy. The navy and white-stripped mattress is medium thickness, comfortable and even though it’s mostly folded around the frame within the sofa, it’s not lumpy or uneven. The mattress also has a plastic covering on it, which we have left on, to protect from toddler biscuits, which often get dropped down the back! If you are thinking of an investment piece with outstanding quality or are looking for a new sofa bed that doesn’t look like your standard saggy sofa bed then I would highly recommend checking these guys out. 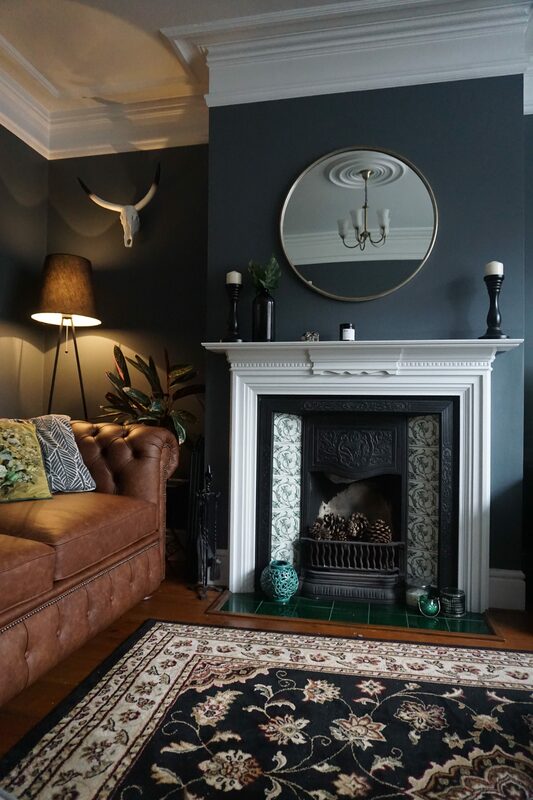 The team are on hand to talk you through their products and send out samples for free if you need to hold up different shades in your living room. I wanted to also mention that the delivery guys arrived an hour before the 7am scheduled delivery and patiently sat in their van waiting (I would have obviously let them in for a coffee but I didn’t know they were there). They lifted our sofa in place and also took away all of the packaging. They also gave us a demo of how the sofa bed folded out and made sure we were totally happy with everything before the left. 1st class delivery service! 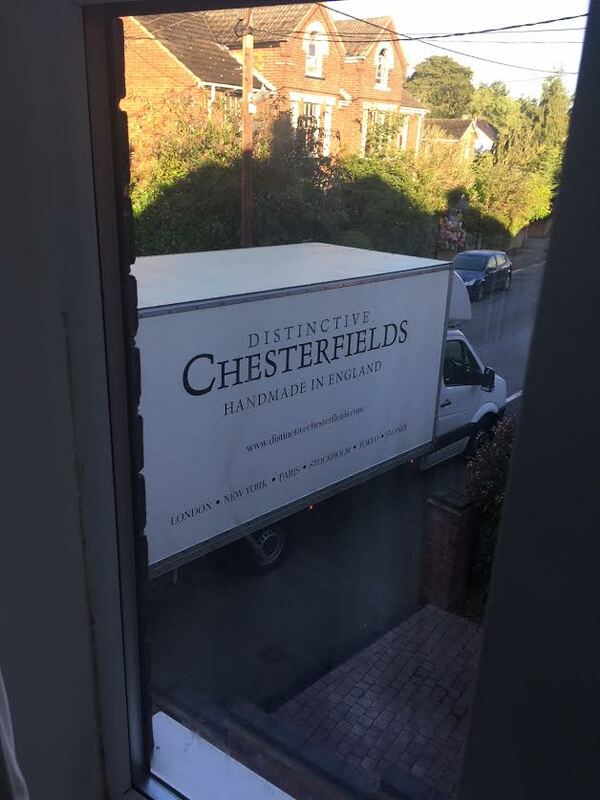 You can view all of distinctively Chesterfield’s products here.